I have spied my lady again in MinamiKasai sporting a freshly cut flower. I have spotted her many times in all seasons. She has been bundled up with a scarf. Kept her head covered in the blasting heat of summer with a hat. I enjoy keeping an eye on her. 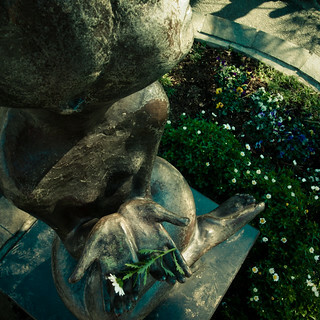 She represents the changes in the seasons by what she holds in her hands, and what is wrapped around her body. Her copper-hued skin burnished in the winter light, is a beautiful sight for my eyes. Keep your eyes open and see what she’ll be holding in the future. It was a cold day. 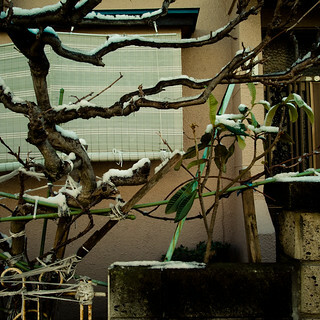 In fact it was the day that snow had fallen across the Kanto plain. I was out on my stroll looking at the snow, and snapping some pictures along the way. I headed to one of my favorite spots in my neighborhood. That space is on the riverside that tucks under the Maihama Bridge. 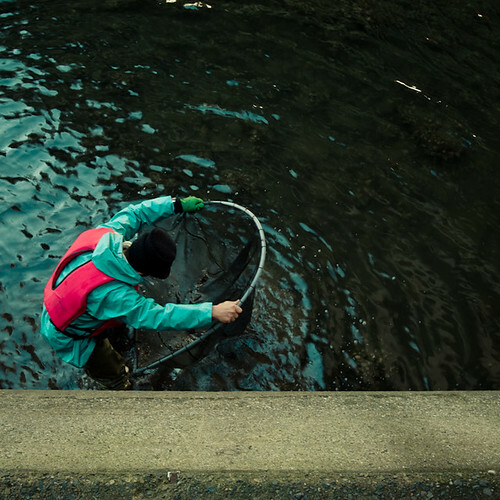 A place that is visited by graffiti writers, punks, and fisherman. I am never quite sure what they are catching in the murky green waters, but they do come. Today I spied a few people in the water. They were all carrying large u-shaped fishing nets. They were rather large and the men were scooping up the water and looking for something. What were they looking for? They were looking for life. Isn’t that what we all are looking for? We all are digging in the dirt. Sifting through the dust, searching for those nuggets of life that sustain us all. Separating the chaff from the kernel. Life is a stubble, yet it is so beautiful. Wading on through the muck we will find the beautiful sustaining nutrition of life. Cast out nets and search! Beautification takes many forms in Japan. By definition beautification is the attempt to make something that is not beautiful more beautiful by altering the environment. 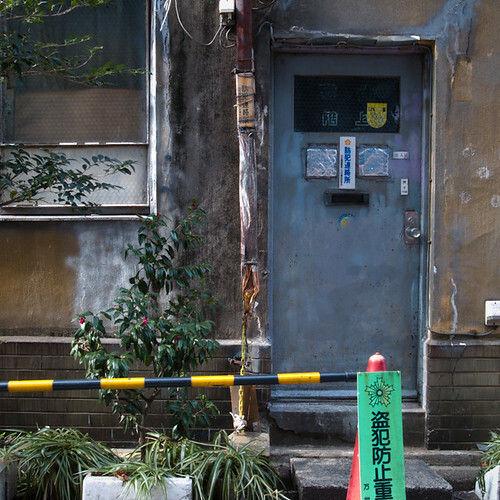 I come across these beautification projects on my wanderings though out Japan. 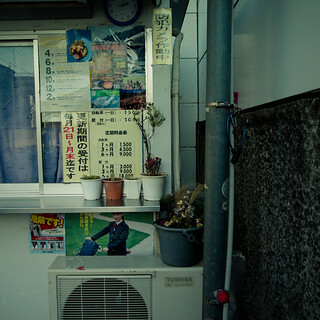 The two images in today’s post are from the bicycle parking attendant’s hut at Mimomi Station in Chiba. It is really a bare bones kind of station. Not much to be seen or make itself special in anyway. It is obvious that the attendants take pride in their location and have tried to spruce up the grays with plants, posters, and reflectors. All of these elements are the beautification of the simple bicycle parking. My favorite is the laminated picture that has been adhered to the wall under an empty window. It is a pleasant setting of somewhere in the countryside in Japan. Autumn trees are blowing gently in the breeze. 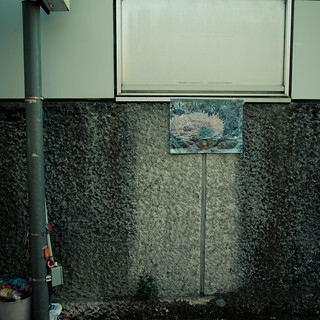 It does seem ironic to gaze onto a concrete wall to have a picture of the countryside there. But then again this is Japan, and anything, just about anything is possible. The ice fungi has again sprung again in Japan. I have never seen them before coming to Japan. In reality they have a a given name of ice needles or ice columns, but I still prefer my given word of ice fungi. They seemingly sprout over night when the conditions are just right. In fact there are so many creative names given to this phenomenon: ice castles, frost castles, ice fringes, ice filaments, ice flowers, ice ribbons, frost flowers, and rabbit ice. All so beautiful, but again I got to go with my my heart and I just love the sound of ice fungi. Those conditions are the ground is not frozen, but the surrounding air is below the freezing point. 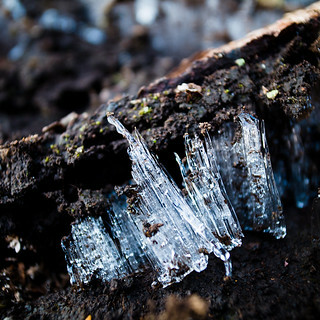 The water is quickly crystalized out of the ground and freeze in the air. 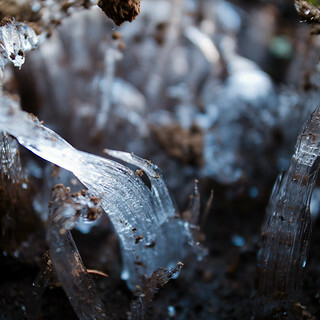 Leaving behind stunning patterns of ice that sprout forth out the ground. They often have little earthen heads, which agains leads me to call them ice fungi. They are tiny. So tiny most people shuffle on by with out paying them any notice. 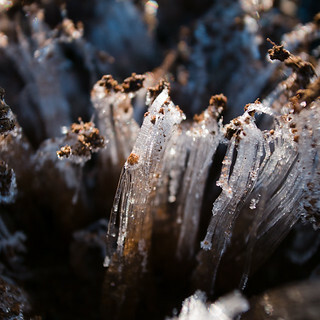 For me, they freeze me in my tracks, and I have to get down on my hands and knees to peep them in their frozen beauty. The patterns, and variations are endless. The mysteries of the world are sometimes right there in our field of vision. The choice is ours if we choose to see what is right there. Or, are we just going to pass them on by like the sleeping masses. 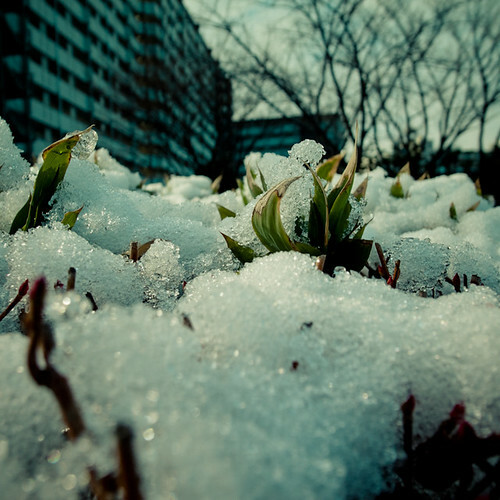 The winter snow was quickly melted into a memory. there are still a few patches of snow here and there, but for the most part on the Eastern side of Tokyo the snow has vanished. I am not one who wants to live in a place with a blistering cold weather. My Miami blood is too unaccustomed to that kind of weather. But I do enjoy the beauty of the snow. The white crystals that form on the leaves. The powered that drops from the skies. They are all so gorgeous to me. Since the March 11th earthquake and tsunami I have been reconnected with the natural world around me. I am syncing with nature, and noticing the habits and life of the plant life around me. It wasn’t that I never noticed before, it is more of that I never payed close attention. All the changes from one season to the next. How flowers bud, blossom, and shrivel in due time. It is all a matter of time between the birth, death and rebirth of the natural world. I plan to keep in sync with the world around me. At least the best as I can. The snow began to fall last night around 9pm. It continued to about 1 in the morning. 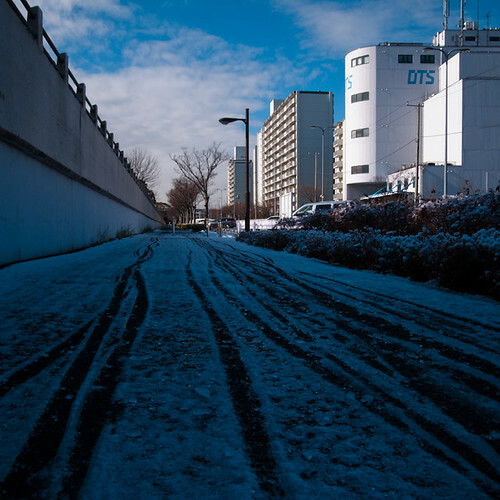 It was the first snow to fall and stick around in the Tokyo area. I missed the snow last year when I was in Miami, so I was excited to see some fall. Watching the clumps of snow fall seems like magic to me. They tumble out of the darkened skies and drift until they find a cozy spot to settle. It calms, and excited me. I woke up in the middle of the night and peeked out the window to see if the snow was still there. There was some, but I was beginning to melt. That was a bit disappointing, but I went for a stroll around the neighborhood just to see what there is to be seen. The streets might not have had much snow, but lots of the snow melted and iced over during the night. I could see more clearly that the night before, but it still seems like another world. Get our and appreciate the changed that happen in your part of the world. You never know what changes you may find. Snow has finally come to Tokyo. The rest of Japan has been hit with record amounts of snow this year. So metropolitan Tokyo ha caught up to the rest of the country. 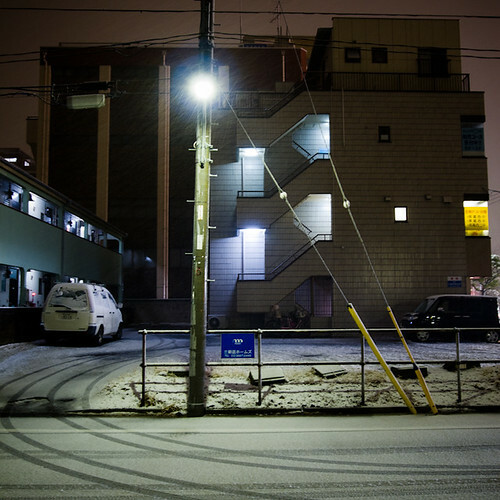 I took a a short walk at about 10pm just to see what old Minami Kasai was looking like with a fresh dusting of snow. Being from Miami, it always seems like magic to see white powder falling from the sky. And again being from Miami, it is NOT that powder, but the one you can make snowballs out of. The crazy thing is about this snow is that there has been thunder and lighting. I have never seen that before. But maybe my people in the midwest can help me out here. I am looking forward to taking a stroll in the early morning to see what there is to be seen. And to get the once or twice a year I get to put on my snow boots. Goodnight from the white night. They say that some snow is on the way. And by they, I mean those that profess the ability to predict the weather. I don’t put any faith in what they say, but dang it surely is gray and cold now. I had a few errands to do so I headed out into my neighborhood to hit the bank, and pick up some ingredients for dinner. I stopped by Kawachiya, which was the first discount liquor store to open, to pick up some imported goods. I amazingly got a 500 gram box of cereal for 198 yen ($2.60). All the way from the country of Lithuania. I just never know what goodies I am going to find there. Had a great simple curry lunch, before heading over to the OK Supermarket to get the fresh veggies. 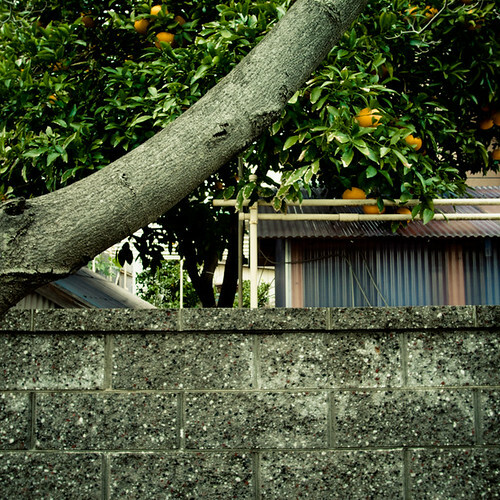 The oranges on the tree were full of life even though the weather was dipping and dipping. It still amazes me how they survive and thrive in the winter time. Even in my little corner of Minami Kasai, next to Tokyo Bay. Some things will last forever. Somethings change too quickly to be seen. Some things move between one phase and an other. It is just temporary. Water is fluid and full of motion at room temperature. In the heat of the earth the water becomes steam. In the dead of winter the fluidity of water becomes motionless. Wet snowflakes fall from the sky moving from one to another. Hitting the wet cement it quickly transforms its alternative self. It sometimes it is all just moment between one phase and the next. Today’s Lucid Thoughts post I will introduce and peek into the creative world of Doug Craft. It actually quite difficult to define him. He is not solely a photographer, because he also is a collagist. He is not only a collagist because he loves music and has an extensive collection of vintage guitars. And on the seemingly non-creative front he is a scientist to boot too. Doug has the ability to combine all of the elements that influence in the collages that he creates. Doug Craft is an amazingly gifted artist that I met back on the wild west days of Myspace. I am starting to think that I should have called these posts, the Lucid Thoughts of the Wild Cyber West. His interests in the golden ratio, and sacred geometry were some of my first lucidly communications with each other. He had taken one of my photographs into Photoshop, and had laid a series of lines and boxes over the image to show that I was seeing these ratios, even though I wasn’t consciously aware of them. Doug clued me in to being more conscious of these design elements when was in the moment of composing images. My compositional style was able to take giant steps as a result from my interactions with Doug. Doug has an exceptional photographic eye; however, I really became interested in how he used his eye to construct simple, beautiful collages. He avoids the trap of many collagists that think more is better. He allows his strongly constructed compositions communicate to the viewed though his guidance by mathematical relationships between the space in the collages. This might all sound a bit too scientific, but there is creativity to be found in the scientific process too. 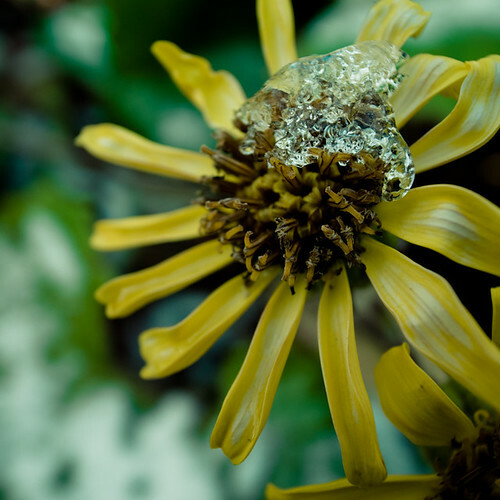 Doug’s exploration of his microphotos explore the natural world that can only be seen with the help of scientific equipment. These microphotos then become an element in his collages. Looking at Doug’s collages I often feel as if I am peering into his past. He often incorporates photographs that he has salvaged from his own family albums. I peer into a black and white photograph of group of women in the 1950s superimposed over a surreal microphoto background. All of these diverse elements working in harmony to create some fantastic collages. I am so pleased to bring Doug Craft’s work to the Lucid Communication family. I hope that you all will take the time to read through his thought provoking interview and explore his website for more inspiration. Doug, please introduce yourself to the Lucid Communication community. Hi, I’m Doug Craft, an artist, musician, and scientist who lives and works in Colorado. I worked 34 years as a research chemist for the Department of the Interior and have been alternatively pursuing art and music since high school. Since retiring in 2008, I am working mostly on music and art in my basement studio. I play bass in an improv prog metal band, Slag Heap, with Max Shiffman (drums), Tristan Cargnell (guitar) and E.J Posselius (guitar, synth). I am married to Randa, and have 2 cats, Henry and Mookie. Life is good! I was 16, and like taking up the guitar around the same time, I had hopes of impressing women with a camera. Sad but true! What was your first camera? And do you still have it? I started shooting on an Argus C3 my parents had in the closet. It was a 35-mm rangefinder camera that had taken maybe 4 or 5 rolls of film and I decided to go for it. I learned how to guesstimate exposure and how to print black and white using the Kodak series photography pamphlets that were sold in camera and department stores in the early 70s. I was able to use a darkroom at a nearby Navy base where they allowed military family members access. They provided everything – developer, fixative, timers, enlarger. After a period of shooting with the C3, I became more involved playing music, and drifted away from photography. My mom may still have the Argus somewhere in her house. I think of my “first” camera as the SLR I bought in 1978 after I had been working as a chemist for several years. It was an Olympus OM-1n and that was my main camera for many years and many rolls of film. It was/is an awesome and dependable camera! This was the viewfinder where I became a decent shooter, and began to see the world in a composed frame. I continued shooting the OM1 – mostly Agfa Scala (an ISO 200 B&W slide film) – from the late 90s through 2003, when I went digital and decided to sell off all my medium format and 35-mm film cameras to get my Nikon D-70 and some Macro lenses. I have fond memories of my OM-1 and how clean and crisp it felt to shoot – but film is disappearing – and I was glad a guy who was a die-hard film buff bought it. How did photography lead to making collages? In my case, photography did not lead to making collages. But my collages have definitely led to more photography. I began making collages after taking several classes from my art mentor, Duncan Stewart, an art professor at the University of West Florida. Duncan is still active as a working artist, a great teacher, painter, and collagist. Back then, I was making collages using images cut and pasted from magazines. Copyright law was much more reasonable and lenient then and there was a generally forgiving legal attitude towards collage artists. Judges ruled against Coca-Cola when they sued Rauschenberg for trademark infringement for using an image of a coke bottle in one of his collages. That would just not happen today. When I decided to “get serious” about art in 2000 and joined CORE New Art Space, a Denver co-op gallery, I found out that intellectual property law had changed big time. I eventually realized that I would have to generate my own image stock and figurative image material – which is why I seriously expanded my photography activity since 2000. Where do you get your source material for your collages? Back in the day, I would look for old magazines in antique stores – I tried to find higher quality magazine paper that would lay flat when pasted, and keep an open eye for technical images and microphotos I would see in lab magazines at work. I still have boxes of materials I collected and cut out over the years. I can’t use them nowadays without legal risk, but I can’t toss them out either. Since 2000, I have either shot my own collage materials, or found public domain sources for imagery I was drawn to. There are some excellent public domain sources now for higher resolution images that meet my image needs. That was not true even 5 years ago. I obtained a set of large Landsat satellite images of earth from space from the US Geological Survey, the NASA Earth from Space site, and images of deep space objects and planets from the University of Massachussetts/NASA 2-Micron All-Sky Survey (2MASS), and the NASA space telescope and planetary probe sites. The earth and space images have great fractal qualities that are also seen in microphotos and macro photos I have shot since 2000. I have also created my own mathematical fractals using the Ultra Fractal and Fractal Extreme programs. 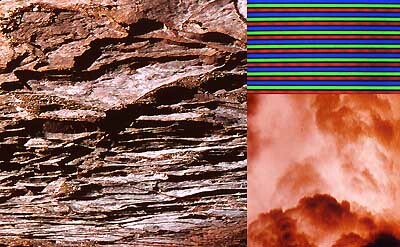 These images are used as abstract/fractal backgrounds in my figurative collages, and as collage of background elements in my Golden Ratio collages like the Elements in Golden Ratio series. For figurative collage objects like people and things, I started going through my own stock of family photos and portraits of friends taken over the years, and some other public domain sources like a calendar of historic photos from my agency, or my father’s cruise books – yearbook-like mementos the Navy published for the crew and families after each 6-month sea duty deployment. The National Archives images are a great source for historical photos of people and industrial scenes and I have been cutting out a collection of them since October using Photoshop. I obtained lots of images of aircraft from the US Air Force and Navy web sites, and several years ago I built a bunch of scale model airplanes, doing research to replicate accurate historical markings and trying to make the models look stressed like real combat aircraft. Since October, I have been shooting these model airplanes in my studio using a green screen and digitally cutting out the resulting images. What equipment do you use to make your microphotos? I used polarizing microscopes, and dissection and phase contrast microscopes that were available for me to use after hours where I worked as a scientist. The geologists identify minerals in thin flat rock samples called thin sections that are mounted on a slide using a polarizing, or petrographic microscope. 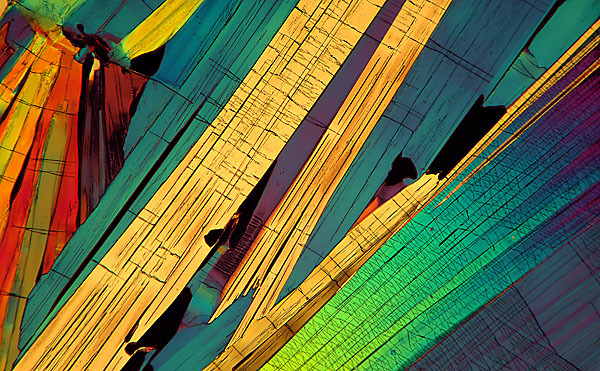 Polarizing filters in the optical path cause crystalline materials in rock thin sections to exhibit vivid colors. I shot many rock thin sections that our geologists prepared for rocks used structurally in dams all over the western US. 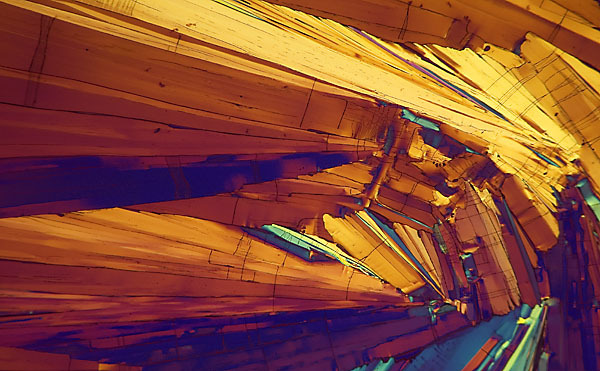 Since I had access to a chemistry lab, I also prepared my own slides of chemical crystals and shot them on the polarizing scopes. I started shooting thin sections in 2000 using a 1971 Leitz DiaLux-Pol polarizing trinocular microscope with a Leitz/Wild 35-mm camera and a Nikon Labophot-Pol polarizing microscope with a Nikon 35-mm film camera. Focus on these microscopes is accomplished using a t-mount eyepiece that is an approximation of the film plane you use in an SLR. With the very narrow depth of field in optical microscopes, focus using a t-tube was hit or miss. I eventually got an eyepiece adapter, a ScopeTronix MaxView eyepiece adapter that allowed me to use my D-70 and focus accurately using the film plane. This improved the focus situation somewhat. I shot a bunch of butterfly wings using an Olympus SZH-10 dissection microscope with a t-tube adaped Nikon FG 35-mm film camera, and focused halogen specimen surface incident lighting. Prepared biological specimen slides from Accu-Scope were photographed through a Zeiss Standard 16 Phase Contrast Microscope with an integrated Zeiss M-35 35-mm film camera. You can see additional details on these scopes here. I have also used an Epson Expression 1680 high resolution flat bed scanner as a microscope. You simply place a leaf or other object on the glass, and scan a small area at 2400 or 3600 dpi. Don’t tell anybody about this – it is top secret! What are the themes in your collages. Planes, personal family history and nature all seem to play a part. Why is that? I have two different thematic types of collages. 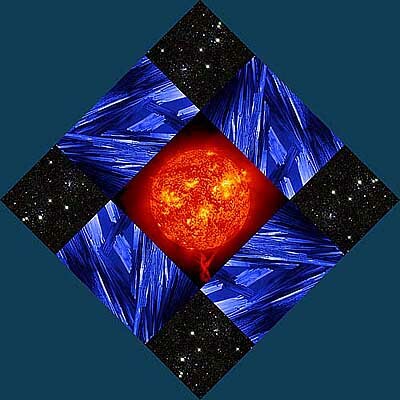 One type I call the collage of backgrounds, where fractal and abstract images are combined using proportional squares and Golden Rectangles. These collages generally combine natural fractal images from varying scales of magnification, and may use specific themes like my Solar Mandalas, or my Elements in Golden Ratio series that used images of earth, air, fire, and water. I would say that nature and Sacred Geometry dominate in these collages, and what I am expressing is the beauty and perfection in nature and the deeper spiritual purpose of art. I grew up in a Navy town, Pensacola, Florida, and my father was a sailor who worked on airplanes. Growing up there were always noisy Navy planes and helicopters everywhere. I was a WW-II junkie and built model airplanes and was always drawing pictures of airplanes. So my attraction to airplanes is long standing. They may represent many positive and negative things – the freedom of flight, patriotism, protection, empire, warfare, waste, mass murder, destruction, masculinity, and technology. Anyone who has been to an air show and seen the Blue Angels or the Thunderbirds knows how viscerally exciting – and intimidating – military jets are. They are awesome and terrifying symbols of our age and civilization. Many of my collages combine feminine and masculine images that speak on some level to the duality of biological life and sexual reproduction. Many of the images I am processing now from the National Archives are of women working in aircraft factories in WW-II, which brings up a different take on the masculinity of airplanes and warfare. War images, industrial facilities, and atomic detonations are another theme that keeps coming up for me. These images arise from my experience as an environmental scientist where I looked first hand at data showing that we were destroying the environment, wildlife, and the fragile ecosystem that supports life. I also have studied Peak Oil and energy depletion, and the danger to mankind from resource wars that spiral out of control is another issue that really concerns me. These admittedly disturbing collages are a combination of my way of dealing with the bad news, and sounding a warning of the danger we face as a species. I am also in a more reflective period these days. After my father died in 2008, my mom gave me a big box of family photos that I scanned. This led me to write a family history and re-connect with cousins and relatives I had not seen in over 30 years. I have also been processing many of the family photos for inclusion in collages. At this stage of my life, death is no longer an abstraction, and the meditation on my own origins, family, and friends who have died is another theme in my figurative collages. Some artist’s collages are very complex, yours tend to be simple and direct, what are the reasons for simpleness? I like to use strong formal composition in my art work, and I find that strong composition and eye movement are enhanced with fewer objects. I compose the collages so that the figurative objects draw the eye along proportional power points and diagonals within the Golden Rectangle (aspect 1 : 1.618…) or Square Root of 5 rectangles (1 : 2.236…). Since I am often using abstract/fractal backgrounds that are complex, I prefer to use only one or two figurative elements so the images do not become too busy. You have a background in science, music and art, How are they all related? Well, I see all three as creative vocations and have actually discovered much commonality between the supposedly different disciplines. I think it’s inaccurate to contend that science is left brain and art and music are right brain. All require both sides of the brain and depend on creative inspiration that is ultimately spiritual and deeply mysterious in origin. I have recently had a chapter I wrote on this very subject accepted for publication in an academic book that should be published in the spring. If your readers are interested, they can download a PDF file of the final draft of this paper that discusses the commonalities between art, music, and science. I also discuss the Golden Ratio, fractals, and the holographic metaphor that form the basis of my theory of art. I love how your microphotos and your found images are intertwined, Why is it important to include some of your original images in your collages? As I mentioned, I am now using many more of my own images because of intellectual property issues. And, many of my own microphotos, macro, and landscape images are better than what is available in the public domain. But ultimately, the collage stands on its own – the fact that I actually shot a landscape, microphoto, or image of a person is less important than whether the collage succeeds as as a work of art. Do you approach music and your art differently? When I am playing in my band the creative process is collaborative, so it’s really different from making art which is mostly solitary. If you are talking about my composed music – that process is actually very similar to collage. I compose my music using Ableton Live and Acid Pro software on my laptop. These programs are designed to work with loops (pre-recorded musical passages) to create musical collages. Some loops are copyright free, some are public domain, some I record using real musical instruments, and some I create using Ableton Live. So the similarity to how I make digital collages in Photoshop is striking. Who are your artistic influences and why? Besides my mentor, Duncan Stewart, my biggest influences are artists and musicians who work with a sense of the spiritual in their art and their aesthetics. That would include Kandinsky, Paul Klee, Mondrian, and Max Ernst from the art world and musicians like John Coltrane, Steve Roach, Jon Hassell, Steve Tibbetts, and Robert Rich. Compositionally, I love Edward Hopper’s paintings and really enjoy Gerhard Richter’s work. Gerhard also likes airplanes! I also owe a great deal to the scholarship and writing of Joseph Campbell, and my philosophy professors, Ralph Hunt (aesthetics), and Robert Kleinman (eastern philosophy and cosmology). Campbell exposed me to the aesthetics of James Joyce and Thomas Aquinas, and the notion that art could be a valid spiritual path in life. I am in the middle of digitally cutting out a massive load of images I have collected over the past 30 years, and have a large body of new collages on the way. Several new series should be appearing this spring. The next big art project I have been planning is a series of Golden Rectangle paintings based on some of my microphotos. Musically, I will be getting back to composing with Ableton and Acid and continuing to play bass with Slag Heap. Any closings, comments or Lucid Thoughts? Thanks for the opportunity to toot my horn, Jacob! I would just pass on that the most important thing artists and musicians can do is to regularly work, create, and to develop a habit of working on their craft. Artists are the counterbalance to a lot of negative energy coming to a head for our civilization. Our contributions may not get monetary recognition, but they are extremely important and needed. I have to agree that the world is in the midst of an unpredictable upheaval and art with play a role in the outcome. We do art not to make a fortune, we make art because I don’t know what else I would do to make sense of this crazy mixed up beautiful world. I would like to thank you Doug for taking the time to delve into your convergence of photography, collage, and music. I feel better knowing that there are good people like you in the world. You, personally, have been a positive influence in my life and I am thrilled to be able to share your views and your work with Lucid Communication. 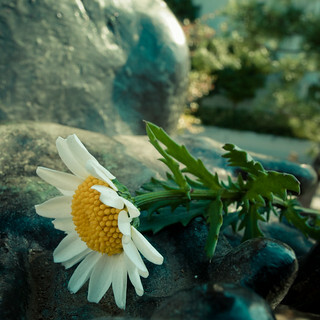 Doug curated a selection of images to be included for the Lucid Communication community. I again invite all who view Doug’s visual explorations by spending some time on his website. All images contained in this post are ©2012 Doug Craft, permission to post them was given to Lucid Communication by Doug Craft 2012. It’s cold. Really cold. It is the kind of wet cold that just goes through your skin and heads straight to your bones. This is when my growing up in Miami has its drawbacks. It is right on the threshold of what I can bear. The rain came all night, and continued into the morning. 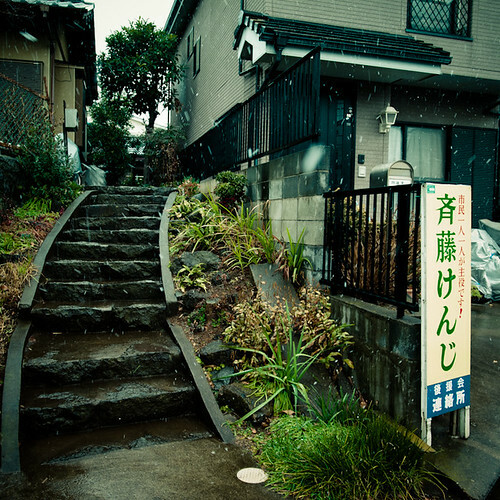 People living on the west side of Tokyo had snow in the morning, but us on the east side next to the bay it was just gray dreary rain. At around 12:30 pm the rain started become a bit slushy. Not ten minutes later did that slush become snow. I stood in front of a large glass window watching the clumps of snow fall to the ground and then vanish once they hit the puddles. Watching the snow come down always relaxes, and excites my soul. Snow was always something special to me. My family only got to experience snow when war were on a vacation. So, as soon as I see snow I think, VACATION! I don’t want to see to much snow. But a few times a winter is enough for me. On this shabbat a special shabbat shalom shout out to Christine for sending some goodies from the states. May all my other friends and family have a beautiful day of rest too! This lost and found object spoke to me on my way home from the station. I haven’t been focusing too much on the lost and found items recently as I have been searching out new subjects. However, this one spoke to me. 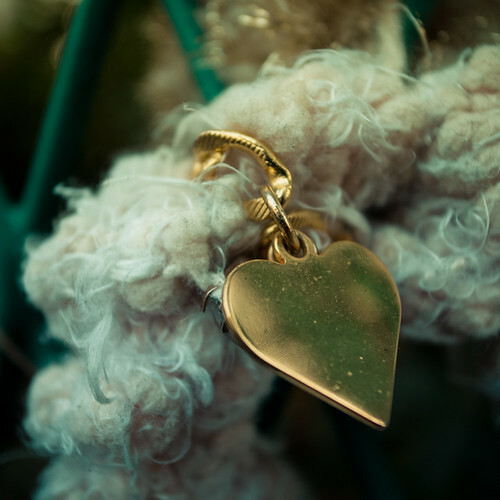 The tiny golden heart on a cold winter day was surrounded my the warm ring of fuzz. The gold reflected the gentle dusk twilight. As I looked into the heart I could see so much that is to come. There are opportunities that will open up. The unseen will be seen. Those new subjects that I am searching for will be found. Not only what I am searching for, but I pray that our communities will find them too. There is so much distractions in the world. People lust after the precious metals. Humans devour the earth in search for them. But, this tiny scrap of gold is not what I desire. In fact it is not what we all should be desiring. We should be looking at the reflection. We should be contemplating our path, and our place in this world. We should be seeking our voice and perfection in what we choose to pursue. Look into the golden heart. and see what it will show you. 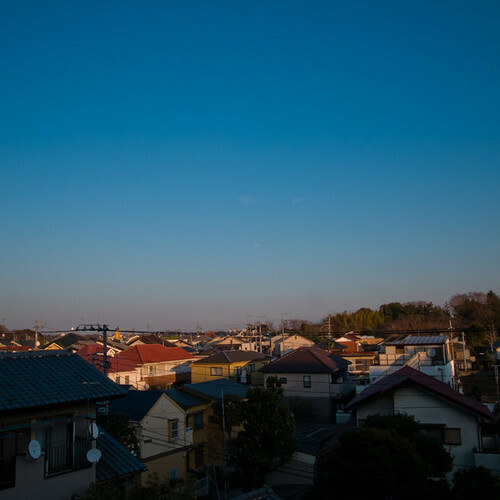 I walked those Ichikawa streets for the last time for a few months today. The sun’s rays were growing long, and the light was just perfect. Sometimes, I just see, and observe how quickly the light changes around this time of day. It is around that time of day, that a few minutes, even a few seconds can make the difference between the most amazing light and just in the shadows. I love watching those changes. Light, and seeing light has become integral part of what makes up life. I wonder to myself, how can people just walk by with out seeing how amazing the light is. I know other photographers know what I am talking about. Golden, yellow, orange, white, they are all there. All one has to do is pause and just open your heart, and see what is happening all around you. So, for now, I bid a sweet farewell to Ichikawa. Goodbye! Take care! I will walk your streets again come April. I needed to head into Akihabara to pick up a few things at Yodobashi Camera. One thing I have got to say is that any electrical goods store, can’t even be compared with the selection at Yodobashi Camera. And the customer service is outstanding. A big shout out to Uehara, who allowed me to charge my Ricoh battery so that I could keep shooting. I am not to big on Akihabara. 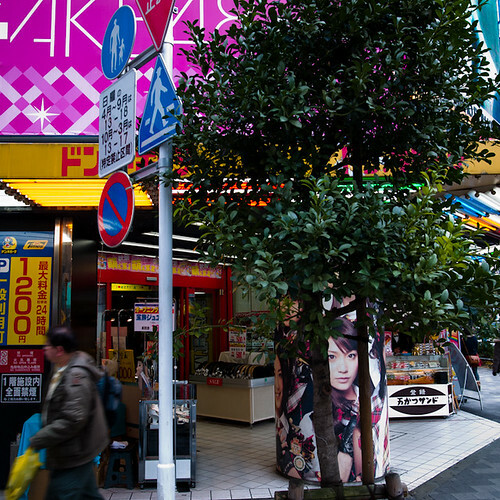 It attracts some of the craziest otaku (geeks) in all of Japan. Some of the backstreets are amazing. They are lined with tiny shops that sell just about anything that requires an electrical current. These little junk shops are amazing. But, what I spied today was how little greenery there was in this part of town. All of the space had been gobbled up by the energy hungry shops and Donner Kebab fast food joints. There were a few oases of green here and there. Sometimes confined to small rows of potted plants in front of a store. Other’s were bound in on all sides by concrete and iron. There among all the neon sings and concrete there was my green. There were the otaku are allowed to roam freely the green pops its head. FInd, the green I will. It reminds me of our delicate connection to nature. I is the beginning of the Limited Green series. In today’s Lucid Thoughts post I am going to introduce the amazing German portrait photographer, Frank Lothar Lange. Also, today’s post is livicated to my father, Leslie Alan Schere on his birthday, who has always supported my photographic journey. Frank Lothar Lange is another incredible photographic soul that I met back in the wild cyber west days of Myspace. We took an instant liking to each other, and each others photographic expressions. Frank was probably the first professional photographer I had come into contact with. Frank was able to see into my images and feel my expression. For that respect, Frank will always have a special place in my heart. He has come to take on the role of my spiritual photographic big brother. When I mentioned this to Frank, he responded with an animated laugh. But it is completely true. I have come to him for advice, as much as to admire his beautiful portraits. Frank has an gifted ability to interact with his subjects through his lens. He is able to show a facet of the sitter in a new way, and cause the viewer of the photograph to connect with them on a lucid level. It doesn’t matter whether he is photographing a super star like Yoko Ono, our his über-ultra-superstar, Karlchen, his tomcat. All of his images let the viewer into the world of who he is photographing. I personally go through phases when I want to engage in photographing humans, and there are times that I become more interested in the traces, and clues that human beings leave behind. When ever I gaze into one of Frank’s portraits, they always give me the encouragement to go out and communicate and engage in interaction with people through my camera. We are living in an image driven world. In this global society we are constantly bombarded with mediocrity. Frank consistently creates images that provoke emotional responses from the viewer. Frank first interacts by digging into his soul to be able to reach into his subject. Next, he extracts something that we have never seen before. After editing he then selects the images that are shown to the world. The viewer then is drawn into Frank’s view of the subject by provoking an emotional response. This is the key to a successful portrait. Does the portrait show us something of the soul of who the image has been created? Frank’s images have the ability to communicate with us, his viewers. 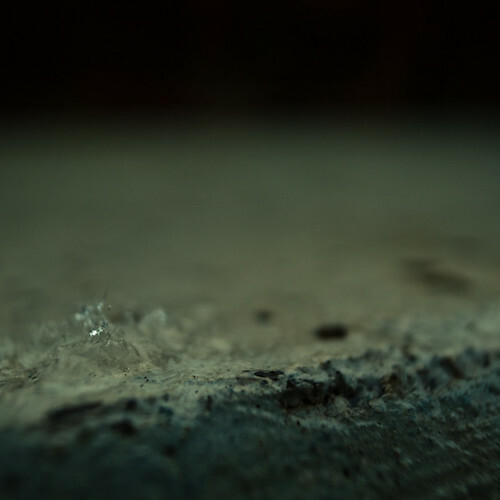 The images communicate soul slices of the subjects that he photographs. One click of shutter. One pop of the flash, and bundles of emotion allow us to enter into human being’s sphere. I was fortunate to engage Frank in some Lucid Communication on the topic of himself and photography, to find out more about his masterful expression using photography. Frank, please introduce yourself to the Lucid Communication community. My name is Frank Lothar Lange, I have been working as a people and celebrity photographer for 28 years. For my work, I have travelled all around the world and have met many fascinating personalities. I live with my family in Essen, Germany. I have always loved to take photos, even as a kid. I started to look into photography professionally at the age of 15, when I got my first darkroom and developed my first prints by hand. What was your first camera? Do you still have, and or use it? I still own all my cameras, I would never sell any of them. For my first sacrament, I was given a Kodak Instamatic 50 by my aunt. I was eight years old then. Later my father allowed me to use his Kodak Retina Reflex. At 15 I fulfilled my dream of a Canon AE-1. Why are you attracted to photography? I just loved to look at magazine covers from all over the world. I used to collect them and hang them up the walls of my room as a kid. I always wanted to create something like that myself. You have some amazing portrait photography. You have photographed Lady Gaga, Phil Collins, will.i.am, Karl Lagerfeld and many more, How do you approach a new portrait? Especially when photographing a celebrity? Before shooting I look at every picture of that person that I can possibly find. In the end I try to do something entirely different from everyone else before me. What has been you most memorable photo shoot? Why? That would have to be one with Usher in Cologne. I still sell those pictures, although they are more than ten years old. He is such a fascinating artist with great body language and a big love for the camera. What is key to capturing a person’s persona, personality, and soul in a portrait? What should someone feel when they look at your photographs? What would you like to accomplish with your photography? It would be cool to know, that somewhere on this earth in one hundred years, there will be a photo that I have taken up on someone’s wall. Collaboration, and communication between photographers is important to you, Why is that? To me this only applies to business maters, I never speak to any other photographer concerning artistic matters. Why is the One Day One Photo Facebook group useful for communication between those that love photography? This group does not cohere to my work directly, it is an independent web project. You do not even have to be a photographer yourself to join. It consists mainly of daily expression photographs taken by members that they post in the group. This mosaic forms a work of art in its own right. How has digital photography, and the Internet changed the photography world? The amount of bad pictures has tremendously increased. Unfortunately good pictures are worth much less nowadays. Many young people have become interested in photography since it has become digital. What makes a good photographer? For me, editing, is one the hardest parts of being a photographer. Can you tell me a little bit about your editing philosophy? You once told me that you put your work up on a wall for weeks, and if you got bored of an image, it was then discarded for an exhibition. Could you tell us a little bit more? Usually I work for magazines and I don’t have so much time so, it’s quick and dirty. You can be sure that 90% of the time they they choose a picture to print that I don’t like so much. That has happened to me too. What if you were getting photographs ready for an exhibition? Then, it’s a long process for weeks. No joke,I need weeks to find the works for the show. Some pictures are the same as food, after some weeks they lost their spirit. They are like spiritual food that must nourish the artist. Thank you so much Frank for taking the time to talk with the Lucid Communication family. May you keep on producing the beautiful and expressive works. Frank curated a selection of his portraits to share with Lucid Communication. I strongly encourage you to drop by his website, and Facebook page to see more of his images. All images in this blog posting are courtesy of Frank Lothar Lange, and are Copyrighted Frank Lothar Lange, All rights reserved. You are experiencing the archives for January, 2012.